Video in, RF out from the DigiLite and no big PC to lug around with you! Bear in mind that the BATC Portsdown Transmitter Project now does a much better job than this!!! Continue if you wish and can find a PVR-USB2, they are a very rare find now! Thanks to Charles G4GUO and Brian G4EWJ for the software bit, this is still work in progress but functionality has been proved. MK808 has had kernel replaced with linux one. SD card has been installed with picuntu linux including pvr/ftdi drivers, scripts,DVB-S generating software. Plug it in and go! 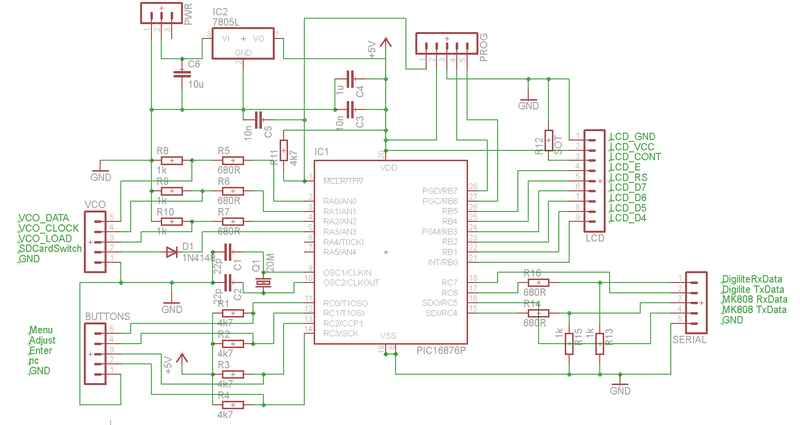 The improved version with controller is now getting near completion so a replacement pic control board will be needed if you already use one for the Ultram VCO control. MK808/DigiLite 'test' release for you all to play with! 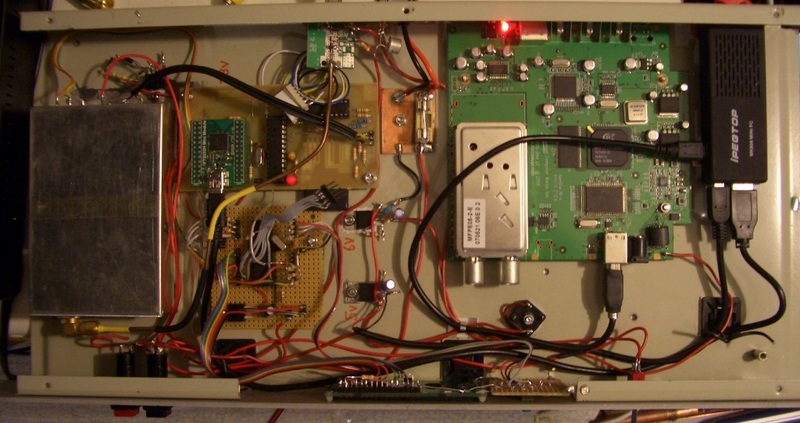 Current problems are with Poor PCR timing related to the PVR and the Linux driver.... this means that one most receivers there are glitches/frame jumps etc... this is minimal on Newer receivers but some old ones will not decode very well at all. Works without any noticable problem on Comag SL100HD, very well on Technomate TM-1500, Comag SL40,SL25... more jumpy video seen on SL65 but quite usable. Sometime i have found the SD Card mode does not initialize but starts ok once rebooted.. not found the bug yet! As of 28th Dec 2013 it works with the PVRUSB2 24xxx AND 29xxx models, HVR1900, WinTV-HVR-1950. 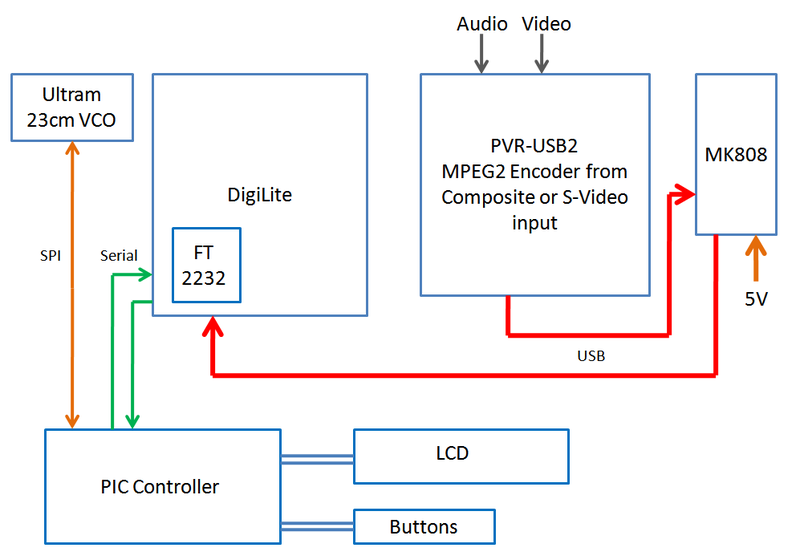 If you need NTSC then PVR-USB2 Model 99016 and 24022 models have been confirmed to work. Basically you need to install the Picuntu Linux Operating system files onto a SD card and replace the Boot kernel on the MK808 with a Linux one using the tool below. 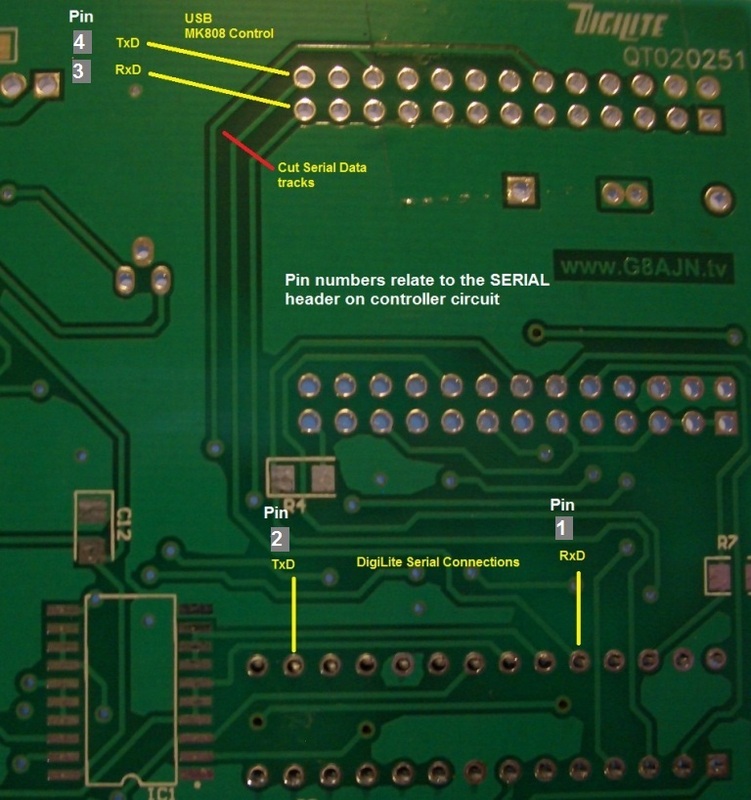 The controller is used in between the original data path of the second half of the FT2232 module, we need to cut the connections of these two tracks and then connect the control board serial header to the four pins marked on the board to allow it to communicate with the MK808 and the DigiLite. I take no responsibility for anyone formatting the wrong disk by mistake when writing the SD Card image - Take care when doing this! The script and compiled hex are also provided in the other files.